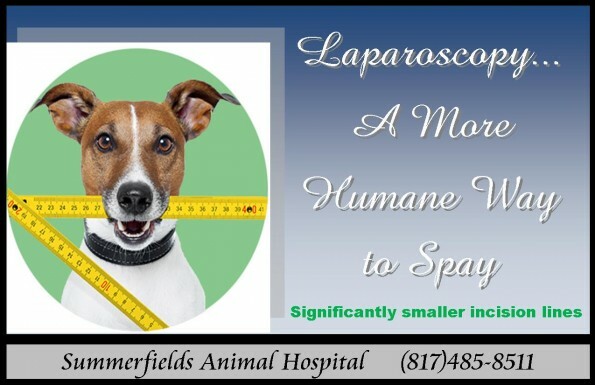 Summerfields Animal Hospital is the first and only general practice animal hospital in our area offering spays and other procedures performed by endoscopy. In a study published in the 2005 Journal of the Veterinary Medical Association, it was concluded that laparoscopic spays cause less surgical stress and up to 65%less postoperative pain than traditional surgical spays. * Using the laparoscope’s tiny camera along with the most modern surgical equipment, we work through incisions that are 6% less than normal size (1/8″ in length), allowing for greater precision and far less disruption internally. Please ask one of our vets about this option during one of your pet visits. In a traditional dog spay surgery, a 2″ to 4″ long incision is made in the abdomen. The veterinary surgeon blindly feels and tears the ovarian ligament from the abdominal wall and removes both the ovaries and the uterus. This tearing causes bruising to the pets abdominal wall, microvasculature bleeding and post surgical pain. These large incisions can take up to two weeks of healing allowing for the potential for infection and self trauma by the pet. Even when performed perfectly by the veterinary surgeon, the traditional spay procedure is difficult enough that potential serious surgical complications can occur both during and after the surgery. 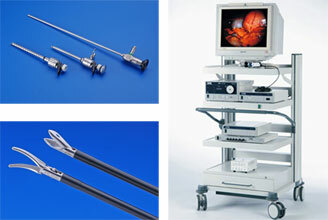 Compare this to our minimally invasive laparoscopic spay. We create an incision that is only 1/8″ long. Through this incision, we can insert a tiny magnifying camera and tiny instruments including a high frequency cautering device. The magnified view of the ovarian ligament allows the veterinary surgeon to carefully cut and cauterize it rather than blindly tearing out as in the traditional spay method. This avoids the potential for certain surgical complications and eliminates the pain your pet would experience from bruising caused by tearing and proves a far less traumatic internally. Dogs spayed using the endoscopic, minimally invasive technique recover faster and can be responsibly discharged the same day. The endoscopic camera equipment magnifies the organs on multiple monitors, so laparoscopic spays allow for complete visualization of your pet’s internal organs. In cases of large breed, deep chested dogs, preventative gastropexy can be performed at the same time of the laparoscopic spay. Gastropexy is a surgery that prevents a common life-threatening problem of gastric torsion and bloat in large breed dogs. 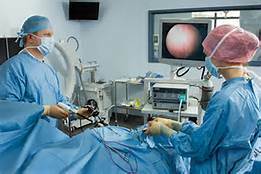 Endoscopic equipment represents a significant financial investment in modern procedures, requires additional training for the surgeons, has a higher supplies cost due to the cautering device, and requires additional time for staff to maintain and sterilize the equipment. For these reasons, the laparoscopic spay costs more than the traditional spay. Many households will continue to choose the traditional spay for budget reasons. Summerfields Animal Hospital offers both the laparoscopic spay and traditional spays performed with very conscientious safety procedures. By using the same equipment and techniques seen in human medicine the laparoscopic spay allows you to give your pet the same care you’d expect in your health care. 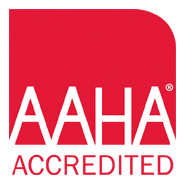 It’s a safer, less painful and promotes faster healing alternative to the traditional spay procedure. Your pet recovers in comfort with considerable less pain and stress. Contact us today to schedule this option for your pet. *Devitt, Chad, DVM, MS, DACVS. Duration, complication, stress and pain of open ovariohysterectomy versus a simple method of laparoscipic-assisted ovariohysterectomy in dogs.Journal of the American Veterinary Medical Association. 2005; 227 (6).